One of my favorite ways to relax for Me time is too have some caffeine. As a mom and a blogger I need a pick me up in the afternoon to keep my brain going thinking up ideas and fun stuff to entertain my son. A simple cup of coffee will do, but to enjoy myself effortlessly I have been buying International Delight Iced Coffee. Its affordable at Walmart and so simple. It comes cold and ready to pour. I have tried other brands but it is never ready made and cold. I only have so much time to myself and taking the time I want to be relaxing to make coffee is using up my time. I am a mom who likes to make the most of each minute in the day. Plus enjoy something tasty! I went to Walmart to get some Mocha International Delight Iced Coffee and a special treat. Sam's Club has the Mocha Iced Coffee variety in a 2 pack for even more savings. Being a budget savvy mom I plan to get it at Sam's when mine runs out. A 2 pack is perfect so I dont have to go to the store as often and also have it handy when I need more. At Walmart I purchased the Mocha International Delight Iced Coffee and some Pepperidge Farm Cookies. My mom would get Pepperidge Farm cookies for herself as a treat and shared them with us. It felt so special to get one of the cookies she enjoy so much. Sitting outside with my garden is the perfect place to spend some ME time. When my son took his afternoon nap I poured myself a glass of Mocha Iced Coffee, grabbed a few cookies, my umbrella and sunglasses to keep the sun off me, told my husband to listen for our son and I went out back to the garden. The flavor of the Mocha is my favorite. Its the perfect balance of chocolate and creaminess. Its not rich but still sweet. I find it refreshing to just sit by the garden hearing the birds chirping, unplugged from technology and just be in the moment of my Mommy Break Time. I hang out for about 15-20 minutes like any job break time and go back to the job I love feeling more energized to take on the rest of the day. Its sunny out so I grabbed my sunglasses and umbrella. Along with the flower lei my son gave to me that day to wear. 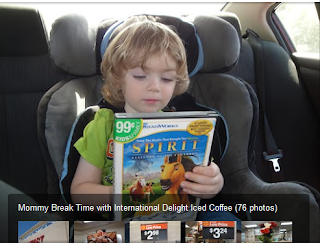 You can read my Google+ Story about my shopping trip to Walmart to save money on my Mommy Break Time treats of International Delight Mocha Iced Coffee and cookies.